This product requires the base game Steep X Games Gold Edition. Extend you Steep experience & go full freestyle with the X Games Pass! X Games DLC : discover a whole new competition in Alaska, win the gold in the most impressive snowparks in Steep’s history and overcome the X Games fierce challenges. 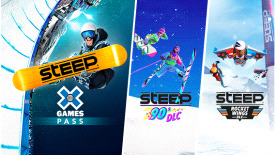 90’s DLC : give your game that old school vibe and make Steep look like a 90’s winter sports game: get 3 exclusive old school customizations, the tricks, the music, it’s all from back in the day! Rocket Wings DLC : soar through skies and valleys in the Alps & Alaska at break-neck speed with 15 new challenges for every daredevil’s favorite sport, Rocket Wings! Get 3 exclusive customizations for your Rocket Wings so you can stand out from the other riders.